Circus worker, lights department. On the Injured List at Municipal Hospital, 7/6/1944, 7/7/1944 and 7/10/1944. Lambert, Richard (11); 41 Spring St. Attended the circus with her aunt, Eileen Gallivan and cousin Jean Gallivan. The three sat on the top bleacher seat to the left of the main entrance. They jumped from their seats and escaped under the tent just before the entire tent became engulfed in flames. 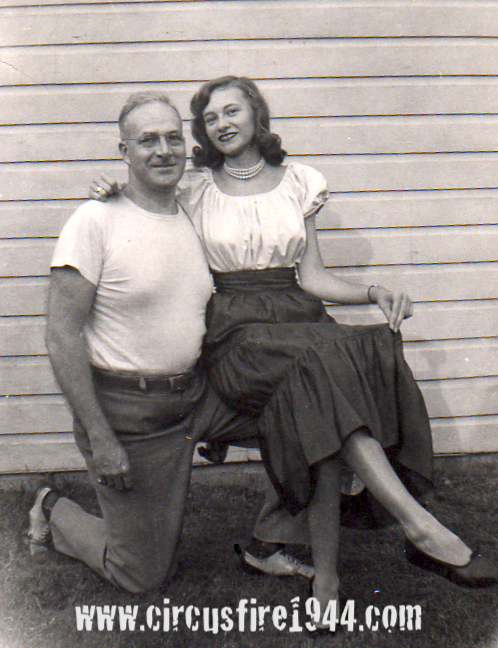 1950 photo of Albert Lawrence with his daughter Diane, courtesy of Dale J. Burns. Attended the circus with his daughter Diane, and both survived with minor burns. Mr. Lawrence's statement to the Connecticut State Police and his daughter's memories of the fire can be read here: Memories of the Hartford Circus Fire. 1944 Photo of Diane Lawrence, courtesy of her daughter, Dale J. Burns. Diane and her father attended the circus and survived the fire with minor burns. 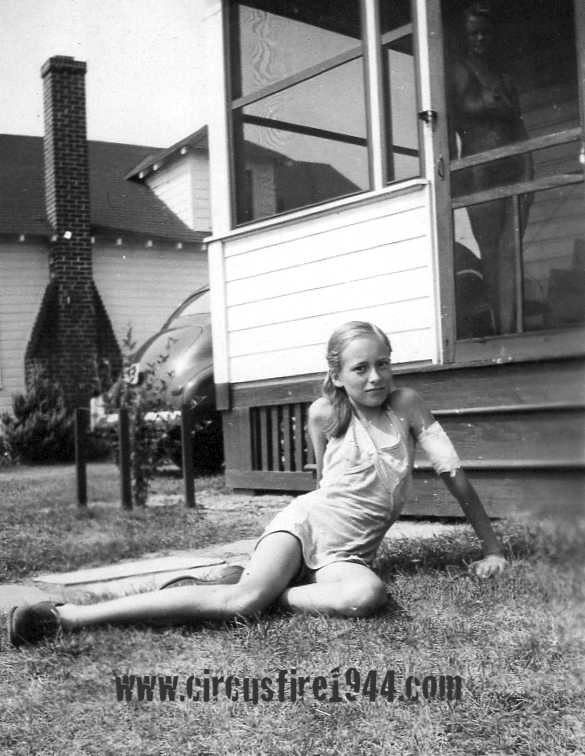 Her memories of the day can be read here: Memories of the Hartford Circus Fire. Attended circus with mother Maxine Lerman and brother Steven Lerman. The family was celebrating Steven's birthday. Attended circus with sons Harvey Lerman and Steven Lerman. The family was celebrating Steven's birthday. Attended circus with mother Maxine Lerman and brother Harvey Lerman. The family was celebrating Steven's birthday. Was awarded $12,000 by the arbitration board for injuries received, including a strained back when he slipped and fell while escaping the burning tent. Attended the circus with his mother, Marion LeVasseur, who died in the fire. Gerald was badly burned and was in serious condition at Municipal Hospital. Gerald and his mother attended the circus with Mrs. James Eustice, Mrs. M. E. Linxwiler and her daughter Mary Ann. Was awarded $650 by the arbitration board for injuries received in the fire. Nan took her younger sister Fran and two cousins to the circus. She and her sister were helped to safety by a police officer and the cousins escaped by crawling under the big top sidewall. Was awarded $800 by the arbitration board for injuries received in the fire, including contusion of right buttock and hand and a blow to the head. Was awarded $2,500 by the arbitration board for injuries received in the fire, including burns to her arms, shoulders, and top of head. Judith attended the circus with her mother and brother, Juliette and Lawrence Libby. Was awarded $5,000 by the arbitration board for injuries received in the fire, including burns to both arms, back of legs, scalp, back and shoulders, and nervousness. Mrs. Libby attended the circus with her children, Lawrence and Judith Ann Libby. Was awarded $10,000 by the arbitration board for injuries received in the fire, including burns to his entire back, arm, shoulder, back of neck, scalp and severe nervousness. Lawrence attended the circus with his mother and sister, Juliette and Judith Ann Libby. He turned 4 years old a few days after the fire, on July 9, 1944. Attended the circus with her brother Harry Lichtenbaum, and both escaped with their lives. Attended the circus with his sister Doris Lichtenbaum. They changed seats before the show began and were able to escape the burning tent safely. Read more from Harry Lichtenbaum here: Personal Accounts - Page 7. Went to circus with her father, Fred Linde, her brother Lawrence, and her two sisters Shirley and Florence. The group sat in the Northwest Bleachers to the right of an animal runway. When they noticed the fire, they ran down the bleachers and toward the exit. Read Shirley's story here: Personal Accounts - Page 8. Went to circus with her father, Fred Linde, her brother Lawrence, and her two sisters Shirley and Alice. The group sat in the Northwest Bleachers to the right of an animal runway. When they noticed the fire, they ran down the bleachers and toward the exit. Read Shirley's story here: Personal Accounts - Page 8. Went to circus with his children Shirley, Florence, Alice and Lawrence. The group sat in the Northwest Bleachers to the right of an animal runway. When they noticed the fire, they ran down the bleachers and toward the exit. Mr. Linde passed away in 1957. Read Shirley's story here: Personal Accounts - Page 8. Went to circus with his father, Fred Linde, and his sisters Shirley, Florence, and Alice. The group sat in the Northwest Bleachers to the right of an animal runway. When they noticed the fire, they ran down the bleachers and toward the exit. Read Shirley's story here: Personal Accounts - Page 8. Went to circus with her father, Fred Linde, her brother Lawrence, and her two sisters Alice and Florence. The group sat in the Northwest Bleachers to the right of an animal runway. When they noticed the fire, they ran down the bleachers and toward the exit. Read Shirley's story here: Personal Accounts - Page 8. Attended circus with her daughter Mary Ann, and Marion LeVasseur and her son Gerald, and Mrs. James Eustice. Mrs. Linxwiler and her child escaped by jumping from the top stand. Attended circus with her mother Mrs. M. E. Linxwiler, and Marion LeVasseur and her son Gerald, and Mrs. James Eustice. Mary Ann and her mother escaped by jumping from the top stand. Attended the circus with friend Donald Miller; the boys jumped from the top of the bleachers and ran to safety. Was awarded $7,000 by the arbitration board for injuries received in the fire, including burns and permanent scars on his arm, wrist and leg, burns to his forehead, nose and top of head, and nervousness. Ralph was confined to Hartford Hospital from July 6 until August 26, 1944. Was awarded $2,300 by the arbitration board for injuries received in the fire, including burns on her body, hands, legs, shoulders, buttocks, arms and hands. Was awarded $1,750 by the arbitration board for injuries received in the fire, including bruises and abrasions to her thigh, hip and back, and severe shock. Mrs. Longdon suffered most of her injuries when she fell from the seating stands. Was awarded $1,500 by the arbitration board for injuries received in the fire, including abrasions, contusions, leg and ankle sprains, and severe nervous shock. Was awarded $1,000 by the arbitration board for injuries received in the fire, including a fractured foot. Was awarded $2,500 by the arbitration board for injuries received when she jumped over a barrier while carrying her baby, including pain in her neck, back, abdomen, and knees. Attended the circus with her husband, Walter. Both would survive without injuries. Attended the circus with his pregnant wife, Mary Ann. Both would survive without injuries. Was awarded $1,000 by the arbitration board for injuries received in the fire, including infection to both eyes.